Your adventure in the world of GrandChase has just begun and it will be a long journey. 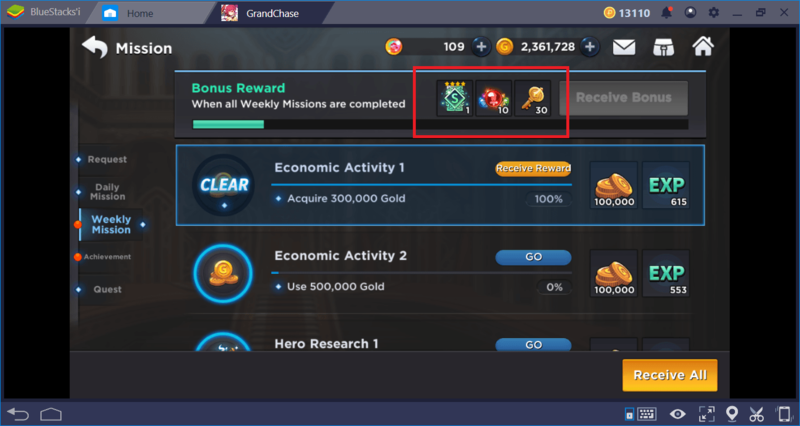 There are more than 70 missions and countless activities that you have to complete: How about getting some tips to do all of them in the most efficient way? 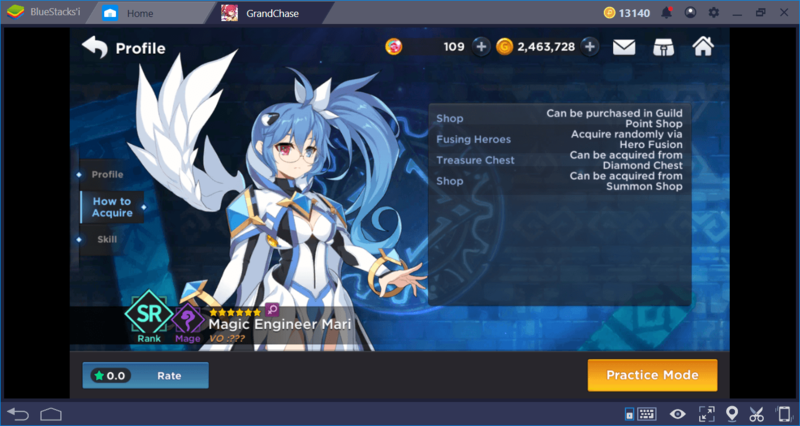 Below, you’ll find some tips and tricks that will make your GrandChase adventure easier and more enjoyable. 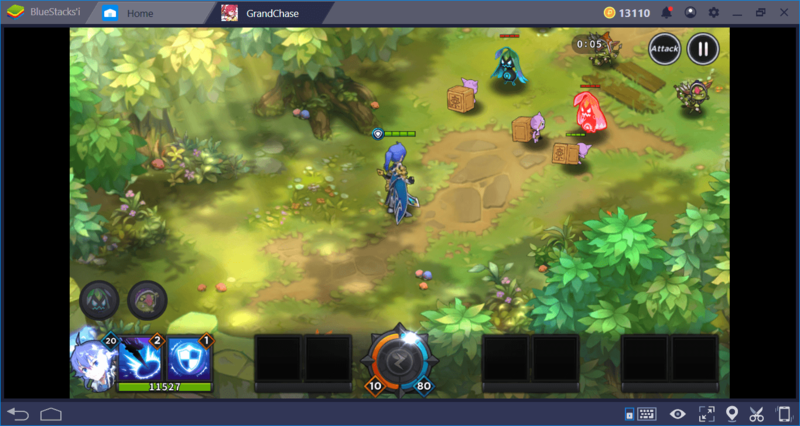 Don’t forget to read the BlueStacks GrandChase Battle Guide: You need every advice you can get to make your journey easier. If you’re wondering how effective a rare and powerful hero is on the battlefield, there’s no need to collect it: With the “Practice” feature, you can try out all the characters in the game. Open your list of heroes, select a character, and press the “practice” button. A random map will be loaded and you will be able to play with your chosen hero. This method will help you to find out which heroes you need to focus on. You don’t need to waste time on a character if you did not like its gameplay. 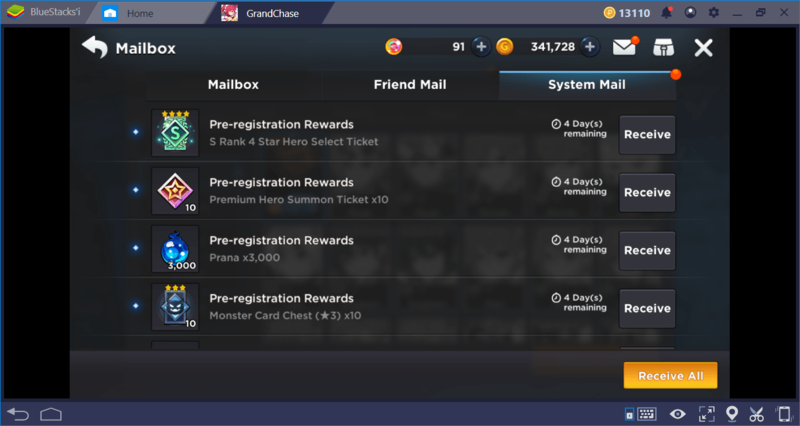 Like every newly released game, GrandChase is also very “generous” in the launch phase. 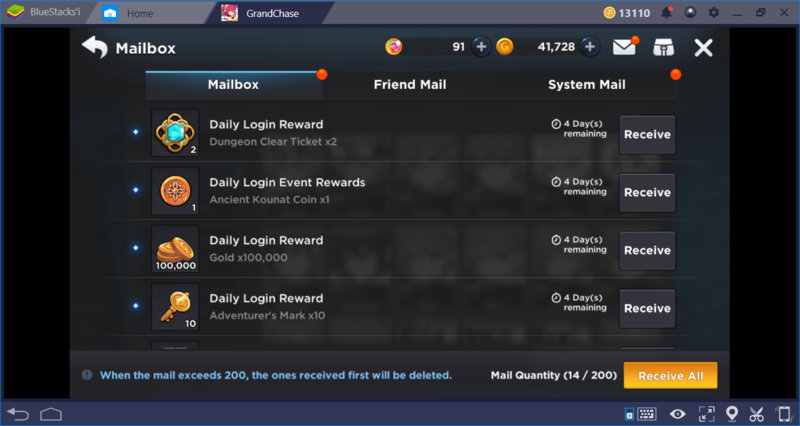 In addition to daily login bonuses, the game is often sending you mail with various rewards. These are not simple gifts: There are many items sold for real money among them and new heroes. $ 30 at the in-game store. However, if you manage to collect all these heroes, you can have this award without having to pay any money. There are many heroes you can collect that belong to a special group. You can see where each can be obtained and focus on a particular list of heroes. 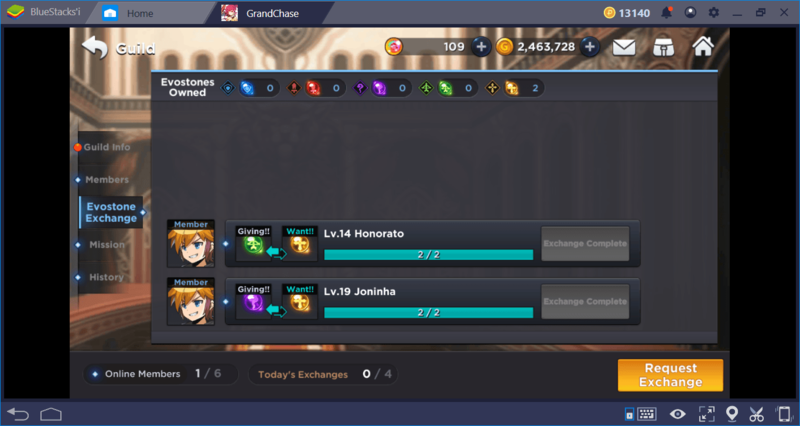 Joining a guild allows you to gain many advantages, but the most important one is the evostone trade. Evostones are an item that are used to increase the rank of your heroes by evolving them. It’s very difficult to collect them, and until you get a specific evostone you’re looking for, you will get a lot of evostones that you don’t need. By exchanging them with guild members, you can easily have the evostones you need. 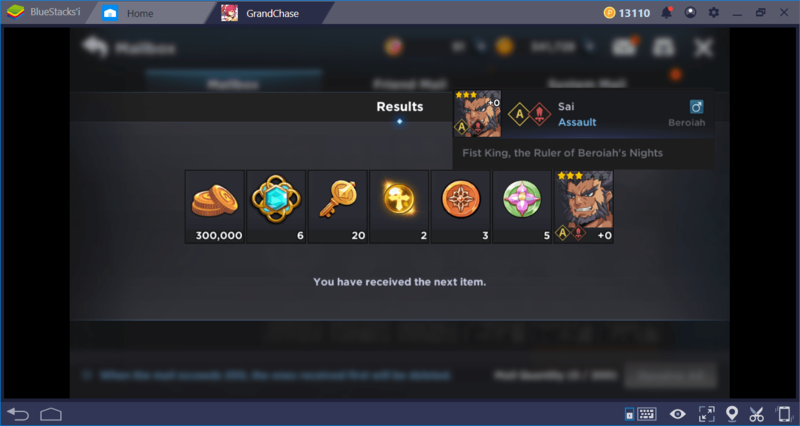 If you think there isn’t much activity to do when you reach the end of the game, you obviously don’t know about the “dimensional boss summon” system. This system allows you to organize your own endgame events at any time. On the home screen, click the bag icon in the top right corner: You’ll see all the items you have in bulk. 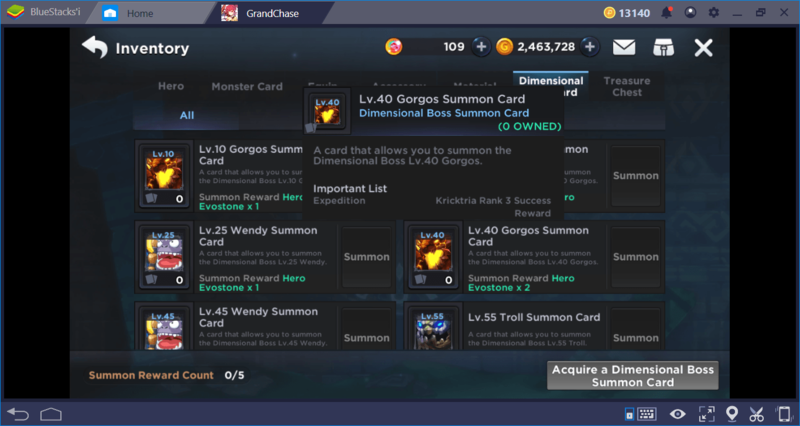 Switch to the “Dimensional Boss Card” tab, you will see a list of bosses that can be summoned. In order to use this system, you must have completed the main story of the game. Boss cards can be obtained from Expedition missions. Once you get a card, you can summon that boss any time you wish and organize an exciting raid. 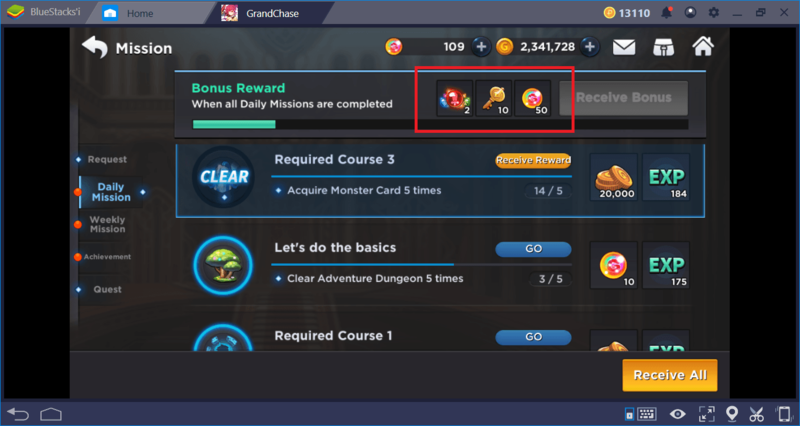 Don’t forget to invite your guild members and friends: These bosses are very challenging and require a lot of players. Having friends not only makes you a social player, but also allows you to get free Adventurer Marks. 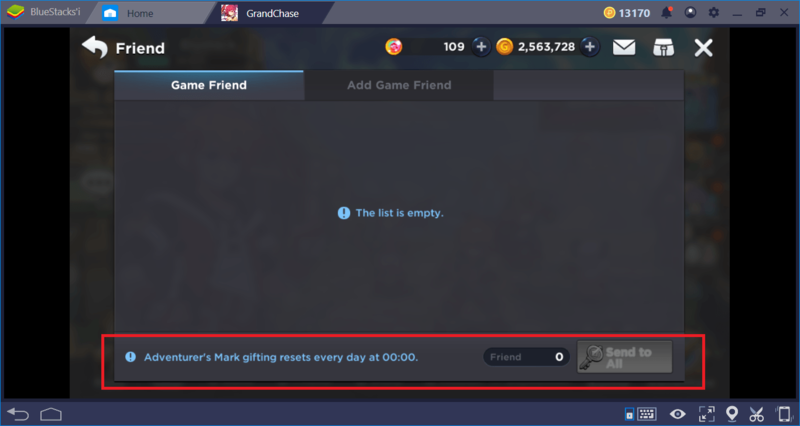 GrandChase lets you send free Marks to every player on your friend list every day. Likewise, you can request Marks from your friends. Adventurer Marks are an item used to open loot boxes, and you’ll begin to get them much more often, especially after Act 3. Inside the crates are very valuable and high-level items, so you’ll want to open them. Adventurer Marks are normally sold for real money, but they can be obtained free of charge every day using the friendship system. Each mission has bonus goals that you can complete. It is not possible to complete all of them the first time, because your party is not yet strong enough. But in the future, you can return to a mission with more powerful heroes and get additional rewards by completing all the bonus goals. 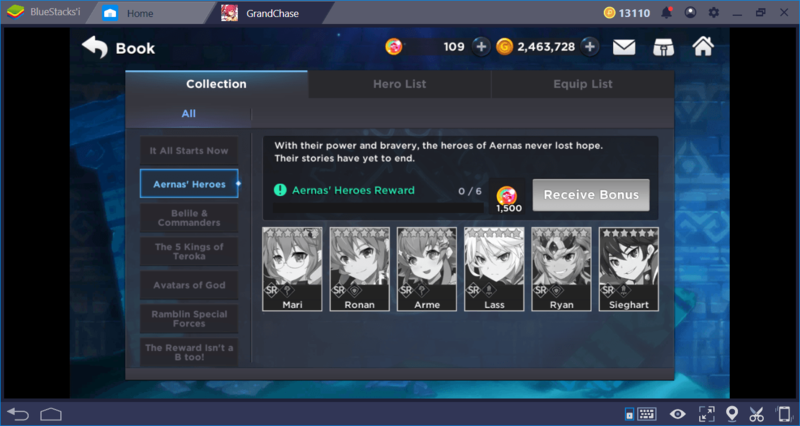 This system not only allows you to earn in-game currency, but also allows you to acquire new heroes. 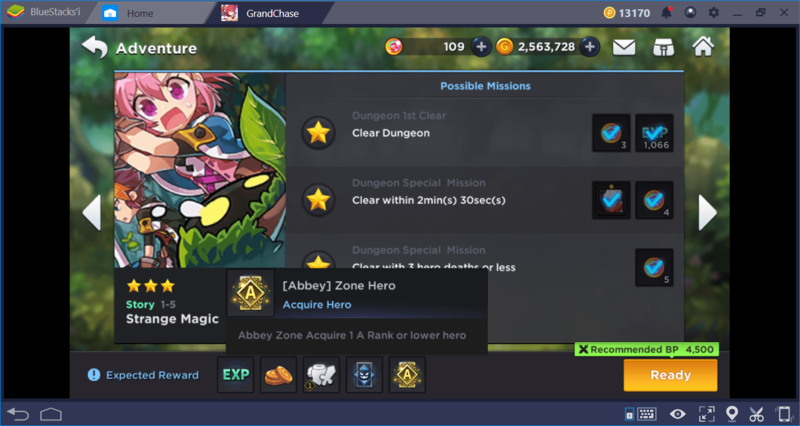 So we recommend that you repeat each mission until you get 3 stars: In this way, you can create a much larger hero pool and get the equipment you can give them. 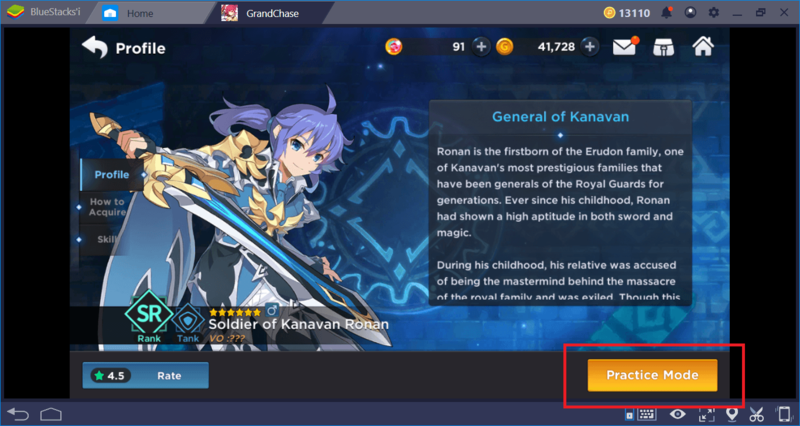 Don’t forget to read our other GrandChase guides to get help on other aspects of the game. Remember – Aernas is a challenging world and you need all the help you can find to succeed in your adventure. See you on the battlefield!